Your child’s first trip to the visit should occur no later than their first birthday. It may seem early, but by this time, his or her first tooth will have erupted. Even that precious first tooth is vulnerable to decay. This visit is about more than checking for cavities, though. Bring your child into the office for a happy visit with Drs. Mohanna and Georgy and see just how fun visiting the dentist can be! It’s worth the quick trip to visit the best children’s dentist near Jenks OK. Our Glenpool office is just a ten minute drive away from Jenks! Your little one’s first visit to the dentist is important for introducing her to the sights, smells, and sounds of the office. Positive experiences from a young age can help set your child on the path to a lifetime of good dental care — and that’s exactly what we are striving for here at Complete Cosmetic Care Dentistry. What can you expect during your child’s first visit to the dentist? Gentle, friendly care. You’ll be with your child the entire time. We’ll take a quick look in her mouth to make sure everything looks like it should. Then, it’s your time to ask any questions you may have regarding your child’s oral health. It’s a good idea to write these down beforehand so you don’t forget anything when the time comes. Should I brush my child’s tooth/teeth and gums? How? How often should I brush my child’s teeth and gums? Because we know how important your child’s dental health is, Drs. Mohanna and Georgy always block off plenty of time during first dental visits to fully discuss your questions and concerns. There’s a lot to learn about caring for your baby, and that includes how to make sure her teeth and gums stay as healthy as can be. One special consideration with baby’s teeth includes avoiding baby bottle tooth decay, which occurs when the sugars from milk, formula, and juice are allowed to linger on the teeth for longer than they should. Prevent baby bottle tooth decay with the following tips. As your child gets older, her visits to the dentist will start to look a bit different. Children’s teeth are most vulnerable to cavities from ages six to 14. Preventive services like dental sealants and fluoride treatments can help to strengthen and protect tooth enamel from tooth decay and cavities for years after their application. 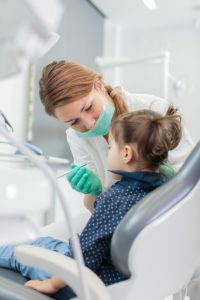 Has your child had her first visit to the dentist? If she’s one year or older, it’s time. Schedule an appointment with the friendly team at Complete Cosmetic Care Dentistry! And why not book one for yourself, while you’re at it? We are the family dentist in Glenpool, OK meeting all of your dental needs.